Building the capacity of poor local communities in rural areas. 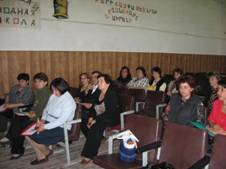 In frame of the joint project with WECF named ELA : “For Sustainable and Environmentally Sound Rural Armenia”, AWHHE implemented activities contributing to the achievement of National Millennium Development Goals 1, 2, 3, 4 and 7. Raising awareness activities: For changing people’s perception and behavior AWHHE conducted information campaigns on safe drinking water supply, eco sanitation, organic farming approaches and sound waste management. There is a great interest of rural people to ecosan toilets. The interest of other NGOs in AWHHE’s agricultural activities (composting, alternative farming, bio humus etc) grew which is testified by increased consultations provided by AWHHE. Ecosan: The main objective related to eco san activities in frame of ELA project is promotion of sustainable sanitation in rural areas. For this purpose AWHHE continues to monitor already built 28 household and 3 school UDD toilets and raises awareness of rural population. Two days workshop for 46 participants (1-International organization, 7 NGOs, 1 journalist, 8 employees of AWHHE, 36 villagers from Hayanist and Khachpar) for introducing UDD technologies and having interested people to apply UDD toilet construction. was conducted in frame of ELA project. Participation of expert Jan-Olof Dragnert from Linkshoping University as a lecturer was supported by Women for Water Partnership through small grant project. Participants expressed big interest to the new concept and many of them expressed their wish to have such a toilet. The second day participants visited 2 school toilets in Khachpar and Hayanist and 3 household toilets in Hayanist. During the training “Ecological Sanitation in Armenia ” the technology of composting the eco san produce were introduced to all participants, and the invited guests from ACDI VOCA organization and Aknashen villagers. All participants were impressed. 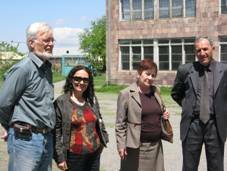 The expert gave positive evaluation on the quality of the construction and the maintenance of the constructed toilets. Drinking water: The main activities are aimed at contributing to the improvement of drinking water supply system in target villages. The new pipeline (length – 350m) is laid on in Hayanist. Construction of the new pipeline gave opportunity for 14 more households to have access to safe drinking water. Water piping for Hayanist was accomplished. Out of the total cost 61% was the contribution of AWHHE and 39% in cash – local authorities. Agricultural activities: The main purpose of agricultural activities in frame of ELA project is to promote the implementation of sustainable agriculture. The implemented activities resulted in an increase in awareness about sustainable agriculture and alternative approaches. Gained information and skills, the implementation of the alternatives and the certification of organic agriculture foster income generating activities of villagers and contribute to the poverty reduction and sustainability of the environment. AWHHE has established the links between farmers and “ Green Lane ” NGO. Now farmers started to sell their organic products via “ Green Lane ”. Field class was organized for 23 teachers, schoolchildren and villagers on Natural Methods of the Agro-techniques in Khachpar. Participants gained knowledge on sustainable agriculture. 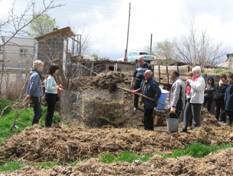 AWHHE organized 3 – day training on composting jointly with WECF in March. The participants were represented by AWHHE members and Georgian partners. AWHHE believes that collaboration and effective partnership with all relevant stakeholders is milestone for effective and successful implementation of the projects to improve and sustain human being’s life.